Hunter Ebony Solid Wood Body Clarinet Description: Specs: Key of Bb, Solid Ebony Body, Forged Nickel Plated Keys and Bell Ring, .577 French Bore. Accessories: Clarinet Case, Clarinet Mouthpiece, Cap and Ligature, Rico Reed and a Clarinet Care and Maintenance Kit. The Hunter Ebony Wood Intermediate Clarinet Rental is nicely styled and provides a smmoth wood clarinet tone. This wood body clarinet is great for any student looking to move up from a beginer clarinet, or great to start out with as yoru first clarinet and includes everything you need to get started. Select from 3, 6 or 9 month rental options. Rental goes to monthly billing at the end of the up front rental period you select and you may return at anytime. There is a purchase option with every rental which allows you to apply up to a specific amount of paid rental fees toward the purchase of your instrument. There are economical advantages to paying for a larger block upfront and those options and discounts may be reviewed above. 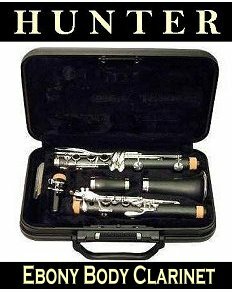 We can ship your Hunter Clarinet rental anywhere in the USA! Order Online Now. Click here to hear a Bb Student Clarinet Sound Sample.